Charles Hurst is delighted to announce that as of Monday 21st May 2018, our new state-of-the-art Jaguar Land Rover dual brand showroom is now open to the public. 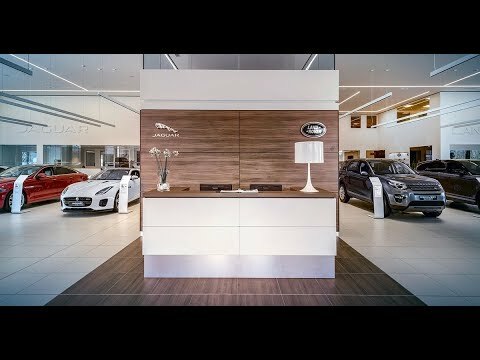 Situated at the front of Charles Hurst's Boucher Road Complex, this outstanding space will offer a new home for New and Approved Used Vehicles which will allow you, our customers, to view our exceptional vehicles in an environment that reflects the core values of both the Jaguar and Land Rover brands. This new-look, dual-brand showroom is the first of its kind in Northern Ireland and boasts modern, light and spacious interior with sumptuous lounge areas for our customers to relax in. A fully staffed barista bar will offer mouth-watering refreshments, daily newspapers and complimentary WiFi. Additional features will include an interactive kids zone and dedicated handover bays, offering you nothing other than the most VIP experience when you collect your new vehicle. Furthermore, our luxurious new showroom brings to Northern Ireland a new, high-tech servicing solution in the form of our Drive-in Service Lane. Available by appointment, the Drive-in Service Lane promises to be revolutionary for our customers. To access this, follow the signs towards the Drive-in Service Lanes and upon arrival, this innovative service will recognise your vehicle registration number and automatically check you in to our Aftersales department. One of our dedicated Valet Parking Attendants will then greet you and direct you on to our service waiting area within the showroom. It’s been an exciting journey creating this new space for you, and the team are looking forward to sharing all the benefits with you. Due to ongoing construction work close to our new showroom, our Approved Used Land Rover range will remain at the current Land Rover showroom (opposite Specialist Cars) until the dedicated space for our Approved Used Range becomes available at our new dual-brand venue. Our Used Car Sales Manager and Sales Executives will be on hand to assist you with your Approved Used Land Rover search at this location. With over 100 Approved Used Vehicles in stock, we are confident you'll find the Land Rover or Range Rover that's right for you at Charles Hurst Land Rover. We would like to inform you that while construction work continues to take place close to the new showroom, a temporary entrance will be in place to accommodate you, this can be accessed via Boucher Road only.